Before we dive into this potentially inflammatory blog, let me start by stating that this is unequivocally an opinion piece. I do not have access to all the bets placed over the weekend nor an indication of the net profit made by punters. This opinion has been formed by looking at the results from Heads&Heads members and discussing the weekend with friends and family who placed bets (ordinary punters) on the 2017 Grand National at Aintree. Enough with the disclaimer, let’s get right into this! On the whole things went extremely well for Heads&Heads members who attempted the numerous Grand National reload offers presented to us by the bookmakers. A private message to myself today from a member confirmed that the top earner came in at just over £800, which is fantastic for what amounts to a days work (if that). On a personal note, hearing stories like this is what makes the running of Heads&Heads 24/7 worth it, and my heartfelt congratulations go to those that cashed in on all the value available over the weekend using Heads&Heads. However, this is not purely a puff piece on how great Matched Betting is. My thoughts on that should already be quite clear. Instead, I’m going to address the elephant in the room that was really made apparent to me whilst watching the Grand National with friends, who had placed bets on the race not using the methods we champion here at Heads&Heads. Is Matched Betting boring? This question sparked a lively debate. In my eyes it is, of course, not boring at all – keeping all the plates spinning while driving towards an almost guaranteed profit whilst only risking pennies. This for me is excitement. However, let it not be said that I don’t understand the point of view of the ordinary punter. Gambling is addictive because of the rush caused by the knowledge of how much you might win and how much you might lose. Matched Betting mitigates the loss risk to essentially zero and in doing so, some of my friends would argue, takes the fun away from certain events like the Grand National. This, I cannot deny. Having backed and layed so many horses across the Grand National, a profitable outcome was a certainty for me. As a result I had nothing essentially invested in the outcome of the race, and sure enough I triggered enough E/W offers that my profits exceeded even those whose ordinary bets had come in. So I suppose in this limited sense, Gambling does win out over Matched Betting. This is perhaps the greatest example of our assertion here at Heads&Heads that you do not need to care or be interested in sport to make significant profits using Matched Betting. Because, to put it simply, 95% of the time the outcome does not matter to us. Fortunately for Heads&Heads, there seems to be more people who’d reject the rush of gambling in favour of a technique that guarantees long term profit. Interestingly, only one person I know (out of family and friends) won any money from placing bets on the Grand National like an ordinary punter - £18 to be exact. When this is compared to the profits of Heads&Heads members who attempted the Grand National reload offers, the arguments in gambling’s favour quickly fall away. Over 90% of our users who attempted the Grand National offers came away with a profit of over £75 and 50% of that 90% earned over £200. Even those who did not trigger any E/W offers (2 in total) had qualifying losses of less than £1. With one of those two triggering an E/W offer for the Masters (golf) the very next day and netting him £38. I’m sure there are examples out there of ‘experienced gamblers’ who can boost £1000’s in wins during the weekend. However, these are exceptions, not the rule. Not only that but, as we know, Bookmakers do not like winners. So unless these individuals lose, they’ll soon find their accounts restricted. So, yes, gambling is a rush but, in our eyes, a wholly unprofitable one. Matched Bettors may not be able to brag about a £2,000 win at the bookies, but that’s because we don’t need to. We know how much money we are going to make ourselves during the year and will happily discuss every bet we make. However, you may have noticed….gamblers only ever talk about their wins, never their loses. For us, this is not a problem and in Heads&Heads’ opinion trumps all pro gambling arguments. 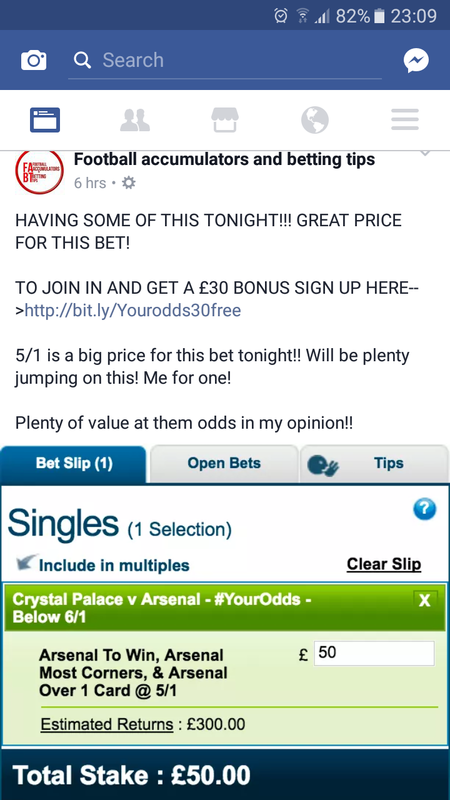 Bonus material: For those that made it all the way to the end, we thought we’d include a screenshot taken on Monday (10/04/2017) from a ‘Professional Betting Tipster’. Arsenal went on to lose 3-0………Whilst maybe hilarious to Spurs fans, it serves as a stark reminder, gambling will always cost you in the end.